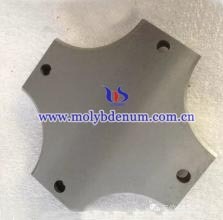 Customized molybdenum target is one of molybdenum target types. Customized molybdenum target shape can be made into different type according to customer’s requirements and the shape usually quite different from the conventional molybdenum target shape. Conventional molybdenum target types include square molybdenum target, molybdenum plate target, round molybdenum target and molybdenum tube target. Molybdenum targets has high melting point, high electrical conductivity, lower impedance, good corrosion resistance and good environmental performance, are widely used in the electronics industry. Molybdenum sputtering target is mainly used for panel displays, thin-film solar cell electrodes and wiring materials and semiconductors barrier materials. With the development of new electronic devices and the new light source, required molybdenum target has good performance, high quality and more complex types, because the conventional molybdenum target types have been unable to meet its development requirements. Customized molybdenum target can be produced to different shapes according to customer requirements to satisfy equipment demand, so it is widely used in various fields.